care not to go too deeply, and a small bore airline is then inserted into the trachea. An alternate method is to use a 12 to 16 gauge intercatheter. 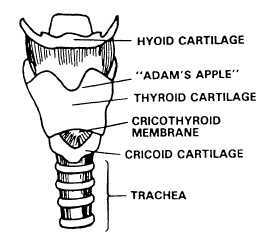 Locate the cricothyroid membrane as above and insert the needle into the trachea. Immediately upon penetrating the cricothyroid membrane, thread the plastic catheter into the trachea and remove the needle. The catheter can then be connected to an oxygen line for translaryngeal oxygen jet insufflation. A cricothyroidotomy should not be attempted except as a last resort when other methods of opening the airway are unsuccessful. 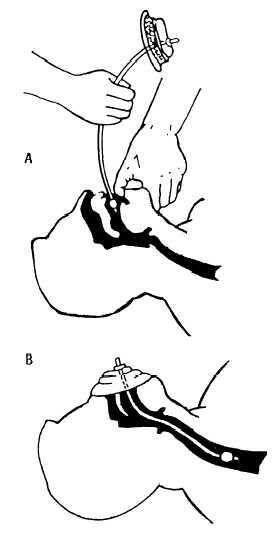 Figure 4-16.Insertion of esophageal obturator airway. In a first aid setting, the hospital corpsman may have access to portable or fixed suctioning devices equipped with flexible tubing, semirigid tips, suction catheters, and nonbreakable collection bottles. The suction pressure should be tested regularly and the equipment kept clean. TECHNIQUE. After testing the apparatus, attach a catheter or tip, and open the victims mouth. Carefully insert the end into the pharynx. Apply suction, but for no more than 15 seconds. Suction may be repeated after a few breaths. Figure 4-17.Structure of the neck to identify cricothyroid membrane. Cardiac arrest is the complete stoppage of heart function. If the victim is to live, action must be taken immediately to restore heart function. The symptoms include absence of carotid pulse, lack of heartbeat, dilated pupils, and absence of breathing. A rescuer knowing how to administer cardiopulmonary resuscitation (CPR) greatly increases the chances of a victims survival.